The clients required a homestead building to be integrated into a unique rural site, appropriate with the long standing farming tradition of the family in the district. The clients were also very sensitive to the impact the house would have on the natural environment and visual access of the public. Recessed into the hill, a traditional gable form is discovered as it unfolds in the landscape. The solid substantial cladding is differentiated to articulate the forms of the house in a modern expression. As with homesteads, the house has the ability to open up to be generous and accommodating or closing down to a more intimate space. Verandahs provide a sheltered transition to the daunting views. 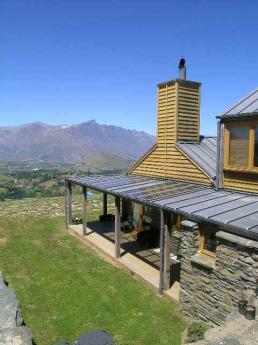 Sited high on Coronet Peak, specific consideration has been taken with the environmental requirements of the site and building. Integration into the existing hummocky land forms defined the stepped and broken edges to the house's outdoor living areas.